Son of Steve Leehane - Carlton (1914-1919). 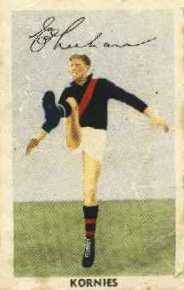 TED LEEHANE broke a bone in his hand half-way through last season, when he was developing into one of Essendon's best players. This smiling, auburn haired six-footer weighs 12 1/2 stone, and has great pace, dash, and ball control, as well as good judgment and anticipation. Probably he would be better able to withstand the buffeting of rival centre half-backs if he were a stone or so heavier, but his pace gets him out of much trouble. 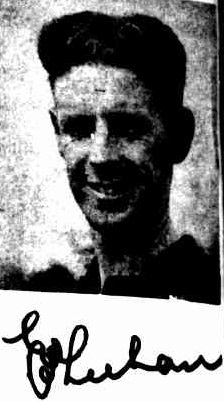 Ted was discovered when playing with Brunswick C.Y.M.S., and had his first senior game in 1942. Since then he has played in 67 games, and kicked 117 goals. He has football in his blood, as his father, Steve, was a noted Carlton player in his day. There is now a younger brother, Jack, on the way to becoming a senior player.